Ready for another robe re-fashion from the 1950s? In this re-fashion, the robe (in the small inset in this image below) was too tight and too short, but with plenty of fabric that made it worth a re-fashion. The original is princess style, and the re-fashion changes it into a double-breasted robe that is longer and wider. What was done? The sleeves, collar, and center front panels were removed. The pattern in the diagram below was used to create new front panels by tracing around the old ones, adding one inch to each side, and four inches to the length. 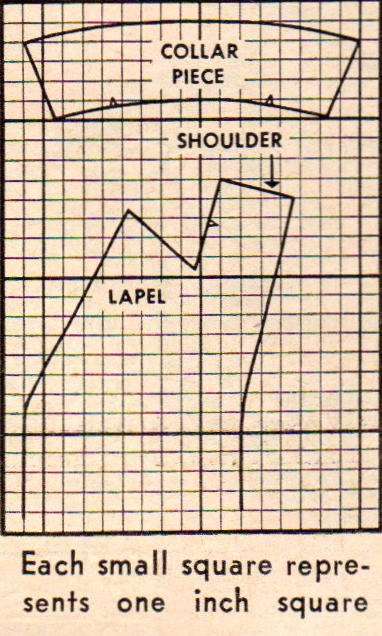 The diagram shows how the top of the new panels were shaped to form a notched lapel collar. Two yards of rayon faille were used to create the new front panels, which are faced. The rest of the robe was lengthened with a four-inch faille band. The robe was also trimmed with six faille-covered buttons. Each sleeve was widened by inserting a two-inch wide strip cut from the old panel under the arm, altering the armhole to fit. Narrow faille cuffs were added.